Bhojpuria ego seems to have rubbed into the non-Bhojpuria judges of Sur Sangram, a reality show shown on the first Bhojpuri TV Channel Mahuaa. Contestants from UP and Bihar are showing their singing talent in this reality show. Malini Awasthi and Kalpana are the two judges who judge the contestants in every episode. But the two judges have no harmony amongst themselves. Malini Awasthi is said to be peeved due to the popularity of Kalpana amongst Bhojpuri population. 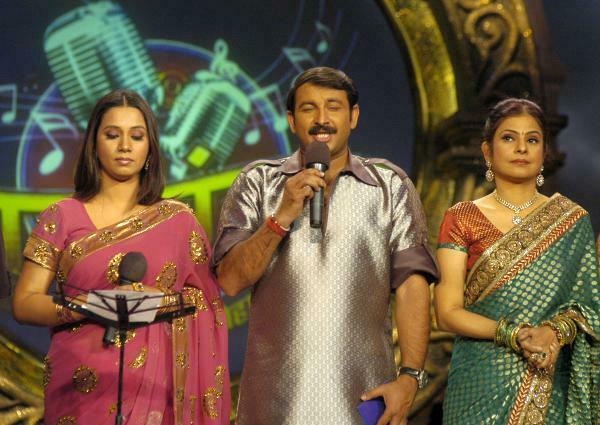 Many of the contestants sing the popular songs of Kalpana or Manoj Tiwari in the serial and Malini seems to dislike it. In the coming episode, due to be shown this week on Friday and Saturday on Mahuaa TV Channel, the two judges have an ugle spat between themselves. When Vijayeta Goswami, a contestant from Gorakhpur sang a popular song, Jeeja Ke Chhotka Bhai Ha, originally sung by Kalpana Malini said that the perfomance was worst and so she was lost somewhere in her thought. This was enough provocation for Kalpana who burst out saying was it the performance or the fact that it was her song? Malini replied that you have small mentality. Kalpana shot back saying yes, you sing for the upper class so you have a big mentality , I sing for the masses and so have a small mentality. Kalpana is so angry with this incident that she is telling that it was a mistake for choosing no-Bhojpuria judges for a Bhojpuri reality show. It would have been proper had Bharat Sharma and Sharda Sinha were made the judges. Malini says that it does not matter who sung the song originally. She was more concerned with the performance of the contestants and even if the contestant had sung a song originally sung by her and the performance was poor, she would have said so. Fortunately the incident was managed skillfully by Manoj Tiwari, anchor of the show. Sources : Based on the inputs from Prashant-Nishant and Ranjan Sinha. Previous Bhojpuri Social Groups are at war, it seems.